Military map of the U.S. It seems like it should be easy to sum up what life in the cantonments/camps was like for the C.O.s. But their writings point out what a mistake it is to make this assumption. These sources are important windows into attitudes toward conscientious objectors. Of course, these “windows” are opened to us through the C.O.s themselves, with all their own attitudes and judgmental lens through which they decided who was friend or foe. Depending on how far the camp/cantonment was from the train station at which they arrived after being entrained, C.O.s and other recruits could find themselves walking several miles just to reach the camp. Upon arrival, they might be sent to a mess tent, told to wait until they could be dealt with, or immediately assigned to a particular battalion (or company?). This made it tricky to know to whom one should state one’s convictions as a C.O. Some may have had something written by their draft board, or a paper from their church to show that they were part of a religious body that was pacifist. Even so, an officer might not be willing to look at it. Some officers were kind and listened patiently to explanations; most were not and wanted more than anything to get rid of these pesky malingerers, as they were called (among the more mild epithets). The early tests for the C.O.s included whether they would sign papers, get immunized, put on a uniform, and drill with the other recruits. If the answer was no, just as often the C.O. would be forced into any and all of these. It was hard to refuse the uniform when one’s clothes were taken away. And some C.O.s went ahead and drilled, perhaps thinking that spearing a bag of sticks was nothing like actually shooting a gun. But everything was used as a test of sincere conviction, and these seemingly minor points could later come back to haunt those who did not say no to everything from the very beginning, and keep saying no throughout any ordeal. The C.O.s faced all kinds of treatment at the camps. For some there were daily tests of will-power and their nonresistant stance as they were heckled, mistreated, beaten, and yelled at. The diaries and letters of the C.O.s often focus on these things, without any thought given to the war itself and how soldiers were suffering overseas. Perhaps they had no access to newspapers, or were unused to thinking beyond their own tightknit communities. Many barely noticed the plethora of types of men surrounding them, not only the army recruits but among the C.O.s themselves. However, some found the melting pot nature of the camps to be intensely interesting and noted not only who all they met, but how these people influenced them. 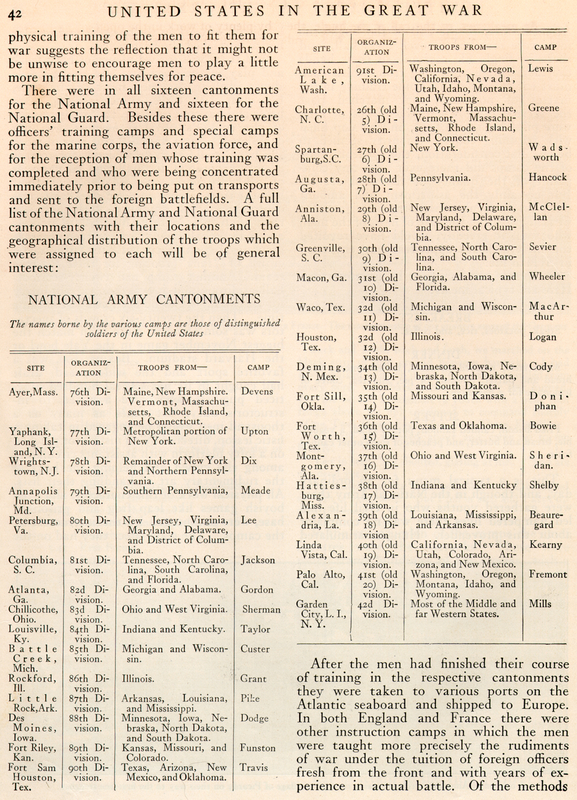 There were 33 cantonments/camps in the United States. 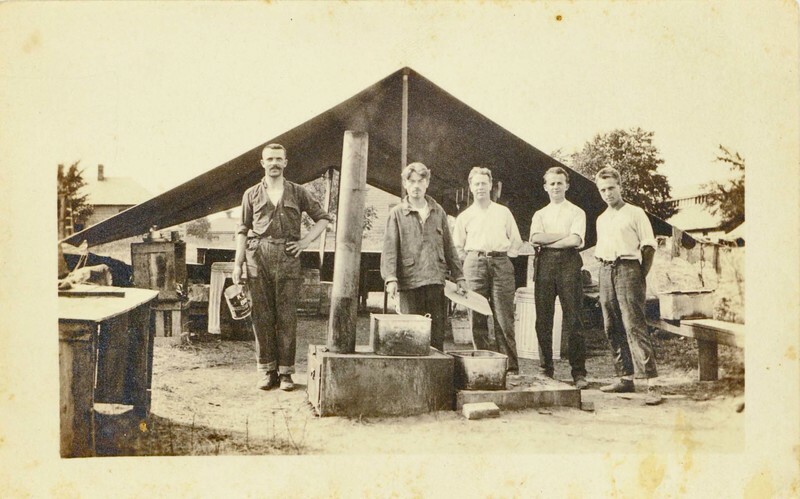 The majority of the American C.O.s whose letters and diaries survive were at Camp Meade in Maryland, Camp Lee in Virginia, Camp Upton in New York, and various camps in the west (Cody, Custer, Devens, Dix, Dodge, Funston, Lewis, Travis, etc.). Men from New York and Northern Pennsylvania were sent to this camp. Men from Kansas, Missouri, and Colorado were sent to this camp. Later, others were sent there as well. 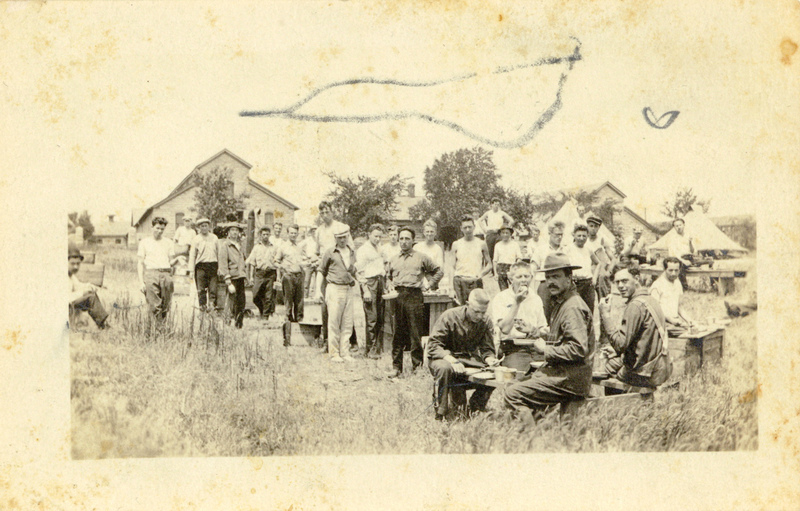 During mid-summer 1918, a number of C.O.s were moved to Fort Riley, about 138 miles west of Fort Leavenworth. One hundred and twenty C.O.s were told to build a cantonment for themselves. Fifty-six of them refused to help with what they considered to be their own imprisonment. Howard Moore wrote: “The morning after our arrival, we were led by armed officers to an open field in which a lot of army tents had been piled. When we had lined up, a major flipped open his holster and with one hand resting on his revolver and the other pointing to the tents said, ‘Now, I want you men to erect those tents which you are going to occupy. If there is anyone who refuses to do so, let him step forward.’ The line moved forward as one man. The major dropped his hand from his gun, emitted an oath, and declaring that we were the most goddam useless lot of men he had ever seen, marched us back to the guardhouse” (Plowing My Own Furrow, p. 107). The fifty-six resisters were put in a field where “tents were in place, but no latrines or cooking facilities existed. At some distance was a single hydrant to provide water for all of us. Still further away – nearly half a mile – was the commissary, where we could, for each meal, receive raw food in our open mess kits. Wood for open fires had to be carried the same distance. The absence of latrines made flies a major problem. We were raided several times by squads of soldiers, who tipped us out of our cots and scattered our belongings. At night we endured a barrage of stones; several men were cut and bruised” (Plowing My Own Furrow, p. 108). After hunger strikes, and being examined by the Board of Inquiry and set for a courts-martial, Moore was taken to the guardhouse at nearby Camp Funston. “In the two-story wooden guardhouse behind a barbed –wire stockade I met nineteen conscientious objectors whom I had known at Fort Riley…. Ever since their arrival at Funston, some six weeks ago…these men had been subject to prolonged, repeated torment by companies of soldiers who raided them every two hours, day and night, dragging them out to run around the parade grounds at the point of a bayonet, scrubbing them with brooms and latrine brushes under icy showers, beating, kicking, and manhandling them. They had been held incommunicado and much of the time on a bread and water diet. Some had been hunger-striking. I also learned that while still in the Fort Riley guardhouse, some of these men had endured the ‘water cure,’ a form of torture used by Wood’s [General Leonard Wood] soldiers in the Philippines during the Spanish-American War. As practiced at Fort Riley, it consisted of hanging a man with two ropes, one around the neck, the other on the arm. The victim, for refusing to put on a uniform, was suspended by each rope in turn until he was unconscious, then laid on the floor and water forced into his mouth from a hose until his stomach was pounded. One of the victims, Frank Burke, died later at Fort Douglas as a result of suffering this treatment at Fort Riley” (Plowing My Own Furrow, p. 127-128). 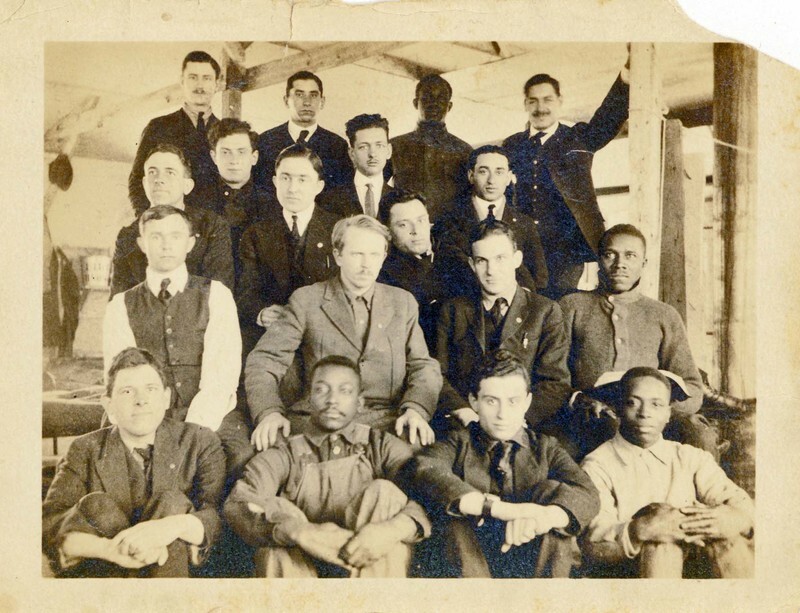 A November 1918 report by an unknown writer also told about the circumstances facing C.O.s: “At Fort Riley some 150 conscientious objectors have been segregated ever since the latter part of July. Most of these men had been offered farm furloughs, but for some reason they were not placed on farms. Serious friction arose, and today practically all these men are in guardhouses either at Fort Riley or at Camp Funston, not far away. The final offense of the men was that they refused to do noncombatant work in cleaning up the army posts. The War Department’s order that conscientious objectors must keep themselves and their surroundings clean has been interpreted to mean that they must serve as clean-up squads anywhere within a radius of ten miles. This the men resent as being virtually military work. Practically the men are regarded as soldiers, though they are excused from military drill and the wearing of the uniform. As we have said there have been some cases of actual torture in the guardhouse. Many men have been put into solitary confinement on a diet of bread and water. Discontent at these conditions has given rise to hunger strikes. A good deal of trouble has been caused by the blundering of minor officers. One man over six feet tall was confined to a cell six feet by five for nearly a week. This was probably due to the carelessness of the guard rather than to the order of any commissioned officer, but it is symptomatic of the blundering that arises in guardhouses. There seems to be a provision that men in guardhouse can have no reading matter save letters, which, of course, are censored, and they can write only one letter a week. This is to many a keener punishment than a bread and water diet and it seems quite unnecessary. Many of these unfortunate conditions are due to faults in machinery and administration, and it ought to be possible for the War Department to remedy them and still maintain the principle of conscription” (“The Present Status of Conscientious Objectors”). A reporter less sympathetic to the C.O.s wrote for the “St. Louis Dispatch” on December 22, 1918: “In pursuance of its duty this commission interrogated the objectors, and among those who refused to accept agricultural furloughs or do any kind of work under military direction, were 18 drafted men from various parts of the country. The status of these men, who had been found not to be conscientious objectors within the meaning of the draft law and the regulations of the War Department, was that of soldiers who were refusing to obey lawful orders of superior officers, and were subject to the same treatment any other soldiers in the same position would have been subjected to. They were sent to Camp Funston for trial by courtmartial for disobedience of orders, considered probably the most serious military offense. 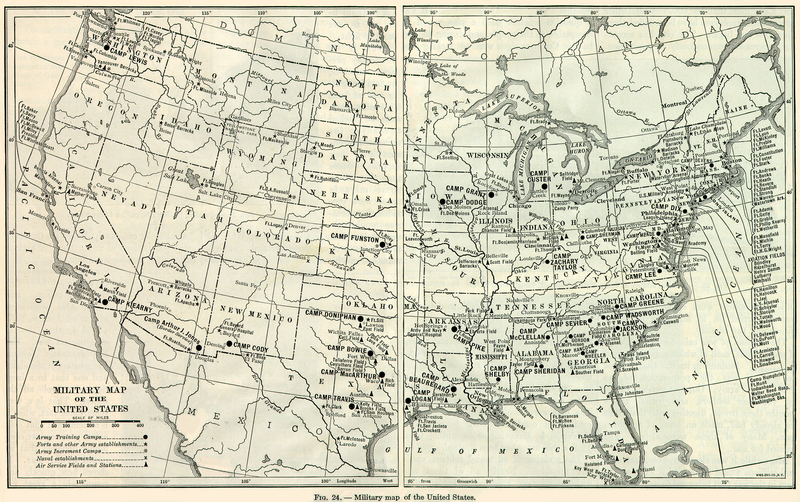 Nearly all of them were men of foreign birth or whose immediate ancestors were born abroad. 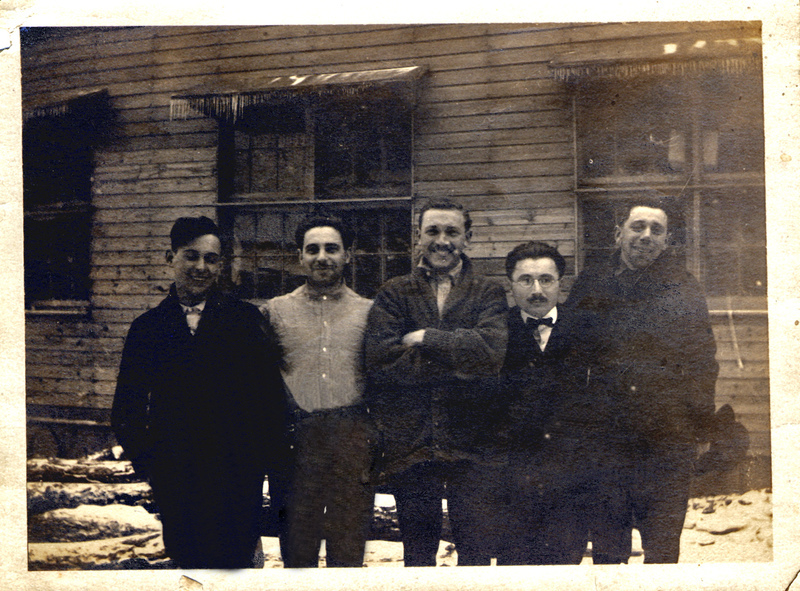 Their names were David Eichel, Julius R. Greenberg, Charles P. Larsen, Francis Steiner, Francis X. Hennessey, John Downey, Mayer Bernstein, Henry Monsky, Max Sandin, Emmanuel Silver, Benjamin Berger, Rexford Powell, Morris Franklin, Thomas Shotkin, Herman Kaplan, Lester G. Ott, Joseph Brandon and Ulysses Da Rosa. Although the courtmartial has been completed, no official statement of its result has been announced, for the reason that the findings have, in accordance with the usual procedure, been sent to Washington for final review by the Judge Advocate General. It is no secret, however, in Camp Funston and surrounding towns that a number of the 18, about 12, were sentenced to be shot. This sentence was commuted on a review of their cases by Maj. Frank White, Camp Judge Advocate, to imprisonment for 25 years. The recent developments, including the order dismissing the five army officers for alleged brutal treatment of these 18 objectors, have revolved about their actions toward the military police detail which guarded them and the treatment of them by the military police and the officers of the camp. Army officers are under strict military discipline which prohibits them from discussing actions of a superior officer or from talking for publication regarding the conduct of military affairs. For this reason no officer was in a position to discuss the matter without placing himself subject to courtmartial. However, it has been possible to obtain the views of many officers from civilian friends of officers, who have been informed of conditions. 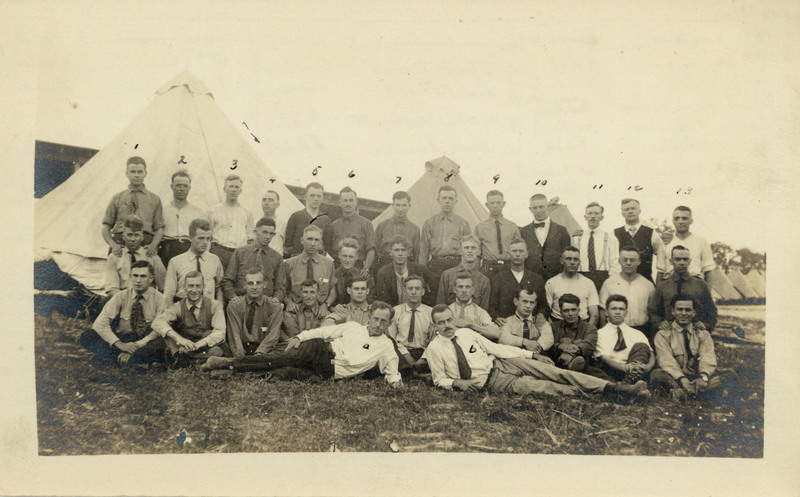 The C.O.s themselves issued a report that told in diary form what they had gone through at Camp Funston: “Thursday, September 5, 1918- Seven conscientious objectors arrived at the Military Police Guard House from the Guard House at Riley. Saturday, September 7th- We were ordered to fold our arms and stand at ‘attention’ by the ‘officer of the day,’ Captain Buckley. Failing to comply with this order he proceeded to abuse and insult us, referring to those of Jewish birth as ‘damn kikes,’ etc. He then had our beds and blankets taken from us, and ordered that we be given raw rations,-pork and beans,-which we were to cook in the toilet, if we wanted to eat. He suggested to the prisoners that they beat us up. We had no supper and slept on the bare floor in our clothes. Sunday, September 8th- Very little sleep was had because of the extreme chilliness of the night. No other provisions having been made for the preparation of food, we ate nothing on this day. We again slept on the bare floor without blankets. Monday, September 9th- Food conditions remained the same until supper, when we were informed that a kitchen for preparing our food would be furnished us, if we would do our own cooking. We were able to prepare supper. Upon returning from this meal we were informed that, henceforth, we would be given bread and water only. Upon this fare we continued until Sept. 15th. Saturday, September 14th. Colonel Barnes, the Provost Marshal, called at the Guard House. He ordered us to stand at “attention,” and when we refused to comply, he proceeded to kick the legs of the men. Kaplan had his legs and ankles bruised as a result. Upon leaving he hinted to the prisoners that he would be tempted to pardon them if they beat us up. Monday, September 16th- We were again placed upon a bread and water diet. This continued until the following Sunday, Sept. 22, on which day we had regularly prepared meals,-so that between Sept. 7th and 22nd we had only two days of regular rations. Monday, September 23rd- We were ordered to stand at ‘attention’ by the incoming ‘officer of the day’ and upon refusal we were told that we would be taken out every two hours during the night. This procedure was inaugurated that very night, when were awakened at these periodic intervals, taken out and kept out a while and sent back to bed. Thursday, September 26th- While walking about in the court-yard, the men were kicked and shoved about for not obeying an order to walk in prescribed military fashion,-Kaplan and Breger being the particular targets. In the afternoon, Larsen was brutally assaulted, being choked, his head banged against the wall and dragged around the room by the sergeant of the guard, for refusing to clean quarters, other than our own. Friday, September 27th- Again, while exercising, the men were grossly maltreated. The bayonet was applied to all of us-Larsen receiving a scar. All were kicked and shoved about. 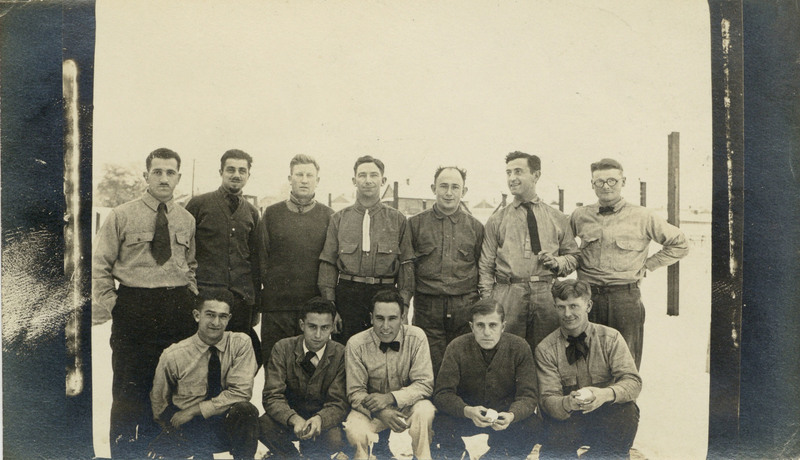 Eight conscientious objectors came here from Fort Riley Guard House. After supper we were ordered outside, where we formed in double rank. The sergeant of the guards issued some military commands to us. When we did not obey promptly, he shoved us about violently… At about nine that evening, we were again ordered out and again put through the same ordeal. This time Steiner ceased walking. He was seized by the ears and dragged around the building. Another guard after a while seized him by the throat and choked him so forcibly that he sank breathless to the ground…. Saturday, September 28th-….The instructions that Conscientious Objectors are to be permitted to exercise is being utilized as a means to impose hardships upon us. We are kept outdoors in all sorts of weather, from six to eight hours each day, and the guards are instructed to see to it that we are moving continually. This is a source of constant irritation and friction between us and the guards, for some of us find it physically impossible to keep walking all day. Thursday, October 3rd- Our correspondence privilege has been restricted to one letter a week. The letter must be written upon one side of one small sheet. Its contents are subjected to careful censorship. A general and thorough raid was made upon our quarters for books, magazines and any other reading matter. All prisoners were ordered to take a cold shower. Friday, October 4th- Orders were issued that Conscientious Objectors are to be given but one helping of food and ‘d—little at that.’ Not even an extra piece of bread is allowed us. We are now kept hungry from meal to meal. Monday, October 7th- …Breger, Monsky, Ott, Silver, Da Rosa, Block, and Eichel have already declared an absolute hunger-strike as a vehement protest against this treatment. Another cold shower was administered to us in the afternoon. At 8pm the “Officer of the Day,” a captain, and the sergeant of the guards ordered all to undress in the squadron and prepare for a cold shower, the third of the day. We were marched to the toilet in a body. The Captain himself brought forth scrub-brushes, used ordinarily for cleaning toilet seats and brooms used for sweeping, and ordered that we scrub each other with them. Franklin refused to use the filthy brush. He was seized and roughly thrown to the cement floor, dragged back and forth and viciously belabored until thoroughly exhausted. He was then placed under the cold spray and left there until he collapsed. Eichel and Shotkin helped him back to his bed. When he recovered he became hysterical. Wednesday, October 9th-…Colonel Barnes, the Provost Marshal, called while some of the Objectors were taking their enforced exercise. He ordered them to stand at ‘attention’. When they refused he beat them vigorously with his heavy riding crop. Shotkin was badly hurt, the Colonel breaking his riding crop over the former’s ankles…. Thursday, October 7th- The men felt that the hunger-strike had accomplished its purpose, in that brutalities had been discontinued for the past few days, and decided to eat supper…. Note- …. Secretary Baker has in the present month responded to the many pleas which have been sent him since August by ordering that in the future American military prisoners shall no longer be fastened to the doors of their cells in punishment. We wish, however, to point out that practically all of the brutalities here enumerated have been contrary to the policy proclaimed by Mr. Baker’s department. There is every probability that men in American military institutions are still being tortured for conscience’ sake” (“The Present Status of Conscientious Objectors - Nov 1918”). Men from Eastern Pennsylvania were sent to this camp. 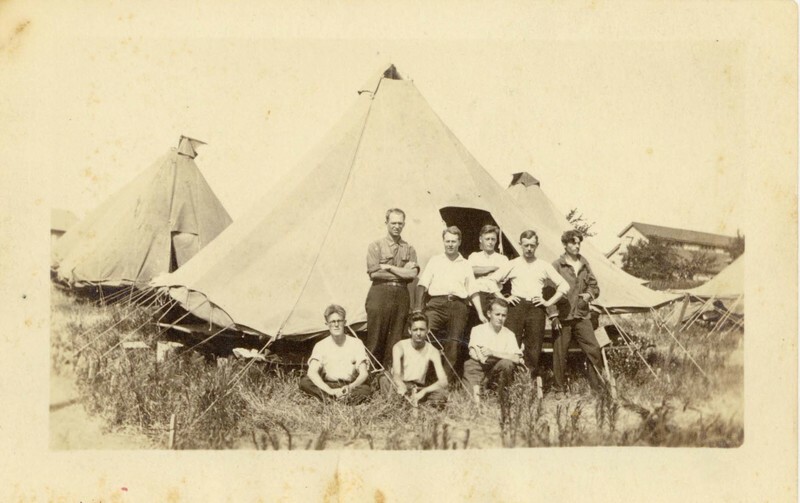 Men from the metropolitan area of New York were sent to this camp. Howard Moore recounted: “At the camp, I was assigned to the First Casualty Battalion as a private, and we were immediately issued uniforms. Up to this time I had stated my protests all along the line, trying to be very nice and gentlemanly about it, but this was as far as I intended to go. I refused to accept the uniform and received instead a storm of epithets and foul abuse. Returning to the barracks, I sat on my bunk, ignoring the whistles and shouts to line up for reveille and retreat. These ceremonies over, an officer with two sergeants appeared in the barracks. The sergeants grabbed me and threw me out of the second-story window. I landed in the cinders of the company street with the window sash around my neck. The company to which he had me transferred was composed of men with venereal diseases. Petty officers constantly threatened me with infection. So far, I had encountered no other conscientious objectors, but here there were several, assigned in much the same way I had been and recognizable by their civilian clothes. A labor organizer named Harry Lee told me they had been going through nights of terror; soldiers on the floor below would ‘accidentally’ discharge rifles, and the random bullets would come up through the floor near the men’s bunks. We made a practice of moving our cots every night. But at the end of a week or so all the COs in Upton were put in one barracks, about fifty of us [in May 1918]. Some were religious objectors, and after a time many of them were discharged for ‘inadequate personality.’ The rest were radicals of one sort or another. They included a few who became my lifelong friends, Evan Thomas, Roderick Seidenberg, and Julius Eichel among them. We exchanged ideas and experiences and had lectures every night, largely autobiographical talks so that we would know each other’s backgrounds and reasons for opposing the war” (Plowing My Own Furrow, p. 99). Men from Kentucky and Indiana were sent to this camp. In a speech by Hon. Charles H. Dillon in January 1919, he reported: “….10. Peters, No. 14589, Mennonite, from Fort Oglethorpe, Ga. Lieut Masey, when reading sentence, told him he was no longer a citizen, and therefore not entitled to hold his religious belief. Ordered to work at the point and prodding of the bayonet. Put in solitary under roof in barn, with only a small, square window for air, under a blazing August sun, on bread and water. Refusing to eat for five days, he fainted, was revived, and put back. Later taken to hospital totally demented and a wreck of a former splendid physique. Pnemonia, influenza, heart trouble, and a general breakdown. Finally discharged as mentally deficient. 11. Detention camp, Fort Oglethorpe. Captain ordered soldiers to put C.O. waist deep in feces of latrine pit, splash him all over with the filth, sergeant in charge leaving him to be pulled out by his fellow C.O’s.